Useful Tips for Excellent Call Transfer: Cebod telecom "
Aside from being able to transfer calls with or without answering, you can also choose between warm and blind transferring. If you are transferring the call to other agents or other departments, this information can help you determine which will be best for each level of service and each department. If a call needs to be transferred to another department. This can be due to the customer needing a different level or service or the call needing to be routed to a different service. You can answer the call prior to picking up the call if you are unavailable. You can also answer, then transfer if you wish to be the intermediary for callers and customer service. There are also further options, including blind and warm transfers to use for call forwarding and transfer. What is blind call transfer? A blind call transfer is when you send a call to another phone number or person in the company without talking to that person first. You will simply answer the call, determine if the customer needs to be sent to another department, then shift the customer over by transfer. The customer is looking for basic help or information that any person would know in that department. Saves you and customer time by being able to connect with someone else who can quickly answer the question, keeping the customer happy. 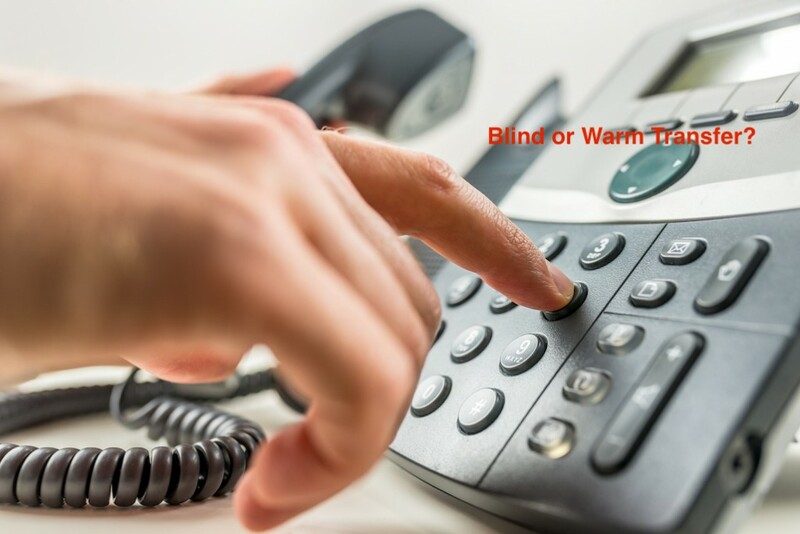 What is warm or attended call transfer? Attended call transferring refers to warming the person up, or providing information prior to transferring a call to the particular person. To perform a warm transfer, you will put the customer on hold, then dial up the agent. You can give them a briefing on the issue that the customer is having. The customer requires some specific information related to a department or a product. Their is an issue or a problem with specific feature or service, making sure that the needs are addressed as quickly as possible. Helps avoid customers from having to be transfer multiple times. For basic information or if there is another department necessary in the beginning, a blind transfer is a good option. This will allow you to get a customer the information that need immediately. Blind transfers also work when you are shorthanded and need help handling customers who need information or services that all agents are able to help with. If a client is having an issue, escalating to a warm transfer offers a higher level of service. Utilizing this transfer also means that the agent can quickly find information on hand, clearing up the use of the phone lines and shortening customer wait times.